Is There a Hidden Lesson Behind Facebook’s Controversial News Feed Change? It’s been a couple of weeks since Facebook announced a major change to their news feed. In case you missed it, Mark Zuckerberg posted that their algorithm will prioritize posts within the news feed that promote social engagement, such as those from friends or those that spark comments, over content posts like those by publishers and brands. The implication for marketers is expected to be dramatic. While I don’t think there’s much to add to the thousands of articles already written on this announced by digital marketing professionals, I do think there’s an important business lesson to be learned by Facebook’s move here. Over the years, Facebook’s growth strategy has basically been to try and “swallow the Internet.” In other words, they want consumer Internet usage to primarily take place on their platform. Rather than just remaining the tool people use for social engagement while they use other platforms for different functions, such as video consumption, photo storage, news consumption, and messaging, they chose to incorporate nearly every consumer digital activity into Facebook. This has allowed them to increase the amount of time users spend on the platform, thereby helping them increase their ad revenues, which primarily come from ads. As the new changes to the news feed roll out, Zuckerberg admitted that he expects that “the time people spend on Facebook and some measures of engagement will go down.” Advertising experts are speculating whether the lost revenues from less time spent by users on their platform will be offset by brands and publishers spending more money on Facebook ads now that the reach of their posts will decline. So the question is why Facebook would risk slowing down its steadily increasing ad revenues with a change like this. 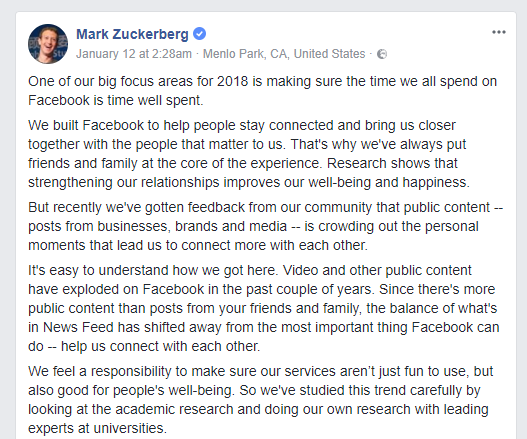 In his post, Zuckerberg notes that based on academic research, connecting with people we care about is good for people’s well-being, while “passively reading articles or watching videos — even if they’re entertaining or informative — may not be as good.” In other words, he’s doing this out of a sense of communal responsibility. That may in fact be his primary motivation, or perhaps there’s another hidden motivation that also serves the interests of his shareholders. But either way, it takes courage to gamble with your company’s revenues. Being that Mark Zuckerberg is proving to be one of the most successful business leaders of all time, when he makes a bold move, there’s usually a valuable business lesson to be learned. To me it seems there is more at play here than purely the well-being of users. While content and video consumption on Facebook may be very lucrative because it keeps users on the platform for longer periods of time than just posts made friends and family, it’s not a very unique value proposition. Users can access aggregated content from their favorite brands via other tools. There’s nothing particularly unique about viewing the headline of a news piece or watching a funny video on Facebook. On the other hand, engaging the world’s largest online community and communicating around posts such as family photos or political opinions, is something that’s uniquely Facebook. And the fact that it’s a unique and valuable experience, one that’s nearly impossible to replicate, makes it “sticky.” If people spend more of their time on Facebook doing those things that can only really be done on Facebook, their loyalty to the platform will only increase over time. If the changes to the news feed create a positive experience, users may still spend more time on YouTube or Twitter doing things that they previously did on Facebook, but they will also spend more time on Facebook. So while the company’s bottom line may suffer in the short-term, it may very well improve over time, and will most certainly bring greater user loyalty and financial stability to the company and it’s shareholders. What Does it Take to Rank on Google? © Copyright SellSide Media. All Rights Reserved. Ready for your business to experience Real Growth through online marketing? Let’s talk.